Lots of "events" going on in and around our place the past 5 days: the visit by an 8th grade class from Mentor, Ohio; Joan Chittister's presentations both in Erie and nearby New York State; and the AIM USA Board of Directors meeting at the Mount on Tuesday. You can read all about them and see photographs here. "This year the AIM USA secretariat commemorates 20 years in Erie, PA, sponsored by the Benedictine Sisters of Erie. I’ve been fortunate enough to be a part of AIM for most of those two decades, coming on board in 1993. The community and I have been profoundly blessed to host the US secretariat. Our sisters have embraced AIM and all its activities. They each receive every issue of the AIM USA newsletter, reading it from “cover to cover,” they tell me. They marvel at the breadth and depth of Benedictine monastic life as it is lived in the Philippines, India, Latin America and throughout the continent of Africa. Their monastic world has grown considerably throughout these years and so has mine. before the US Secretariat came here in 1990. We have three prioresses, Sisters Phyllis Schleicher, Christine Vladimiroff, and presently, Anne Wambach, to thank for being willing to sponsor the secretariat—all who have encouraged sisters to join the staff, did all they could to promote and assist the secretariat, and even served on its Board of Trustees. If Sr. Joan Chittister hadn’t first accepted the AIM USA’s Board request to be its director and immediately set out to establish an endowment fund to assure a future for the secretariat, it may not have evolved into what it is today. If Sr. Mary Lou Kownacki hadn’t brought her professional skills in journalism and fund raising to her role as director, again the office may not have become what it is today. And if so many monastic men and women throughout this country hadn’t responded positively to a request to serve on the Board of Trustees, it surely would not have spread throughout the US Benedictine and Cistercian communities in both knowledge and support. This month I leave the AIM USA secretariat to minister at our monastery as subprioress and we pass its directorship on to a fourth Benedictine Sister of Erie, Sr. Stephanie Schmidt. I know that she and the staff will continue the dedication and love for the good work of the Alliance for International Monasticism. Welcome to the “AIM world,” Sr. Stephanie. May you make as many new friends, enjoy the expanse of your monastic heart, and broaden your own commitment to the Rule and the Gospel of Jesus as I have through my years with AIM." In the midst of all our "special" events and visitors, everyday life goes on. 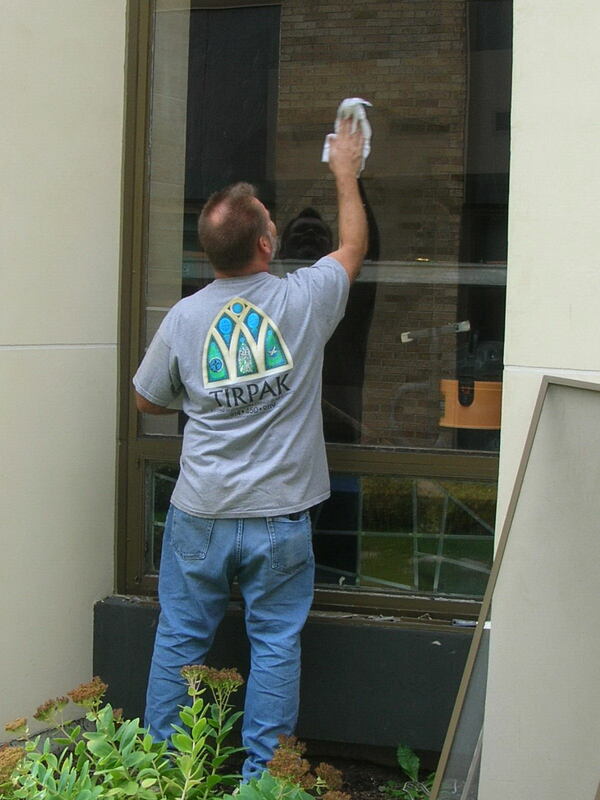 Here in the form of stained-glass window repairmen, helping preserve our windows from decay and wear and tear!